Full-time fitness tracking is increasingly popular today. Many of us go about our day with a tracker on our wrist, connected to an app. But in the past, these fitness watches have not exactly been a fashion statement. Large faces, garish colors, and plasticky straps make them look out of place with many outfits beyond the gym or track. To combat this issue, companies have started designing fitness tracker “jewelry” to help people remain conscious of their body’s habits and heart rates even while they aren’t in workout gear. While we love many of the running watches and fitness trackers out there for their function, style plus function is something we can all really get behind. If this sounds like something you are looking for, you’re in luck. We’ve narrowed down some of the best fitness bling to determine what works best. 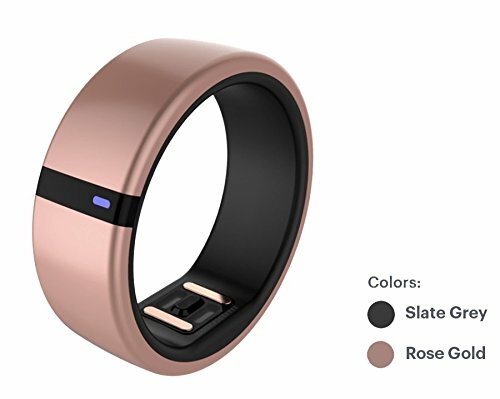 When it comes to discrete fitness trackers, the Motiv ring seems to epitomize the standard. This ring fits comfortably on your finger(! ), monitoring your heart rate, sleep schedule, and steps for the day. The ring has to be sized first before anything can be done. You’ll be provided with different-sized mock rings to determine what fits the best, and then you’ll send in the results along with your choice of color: slate grey or rose gold. Once made, you’ll be able to wear it immediately. The heart rate monitor is located on the inside of the ring, and it’s supposed to sit flush with the underside of your finger for the best results. After that, it’s as simple as checking the Motiv App, where you can list different exercises you completed. It recognizes most common ones, but you can customize and input them manually if needed. Easy to use the app. The Bellabeat Leaf takes a different approach to the jewelry aspect of fitness tracker design. 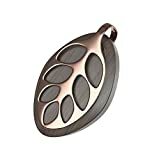 This delightful little piece can be a necklace, a brooch, or a bracelet to track your activities. It’s battery operated, and the battery lasts a long time. One user even claimed to still have a full battery after two months of use. That being said, since this piece really puts its focus on being jewelry, it is not designed to track workouts. You’ll need a separate device for that. Everything recorded on your Bellabeat leaf will be recorded on the accompanying app, which can be accessed on your phone or tablet. The app is well-designed and is all around attractive. You can monitor your breathing, sleep schedule and step count for the day, although where you wear it on your body seems to have an effect on how well it tracks data. Unlike most of the items on this list, the Misfit Bloom necklace is not a fitness tracker. It is, instead, a striking accessory piece to house a Misfit Shine. 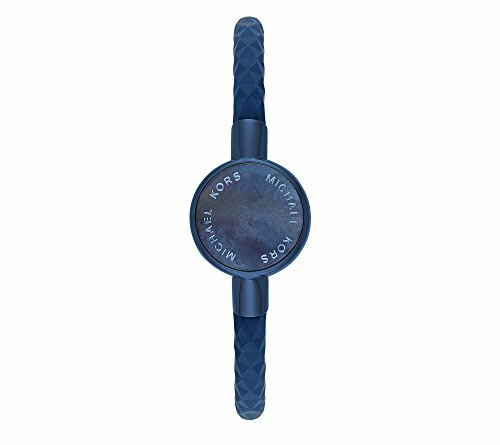 However, it provides a secure fit for users who’d prefer not to wear their Misfit Shine on their wrist and instead wear it as a necklace. 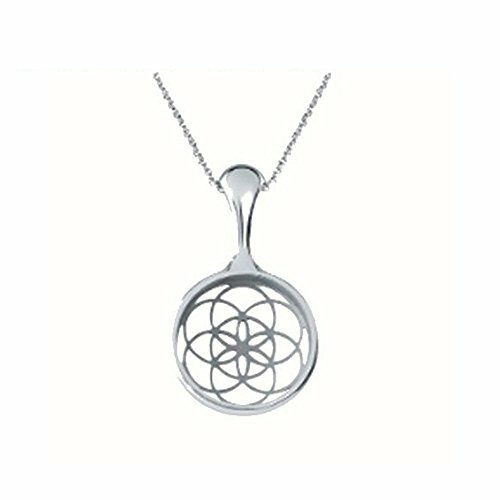 The Bloom necklace features a handmade stainless-steel cage that the Shine can fit into snugly, held in place by a magnet. The design is beautiful and elegant, looking every bit like an exquisite necklace rather than a fitness tracker. It has been noted that if you wear your Misfit Shine in your Bloom necklace, it may not record your sleep patterns as accurately, and if you tend to roll over a lot, you could lose the Shine tracker in your bedding. Can be heavy for some consumers. As far as elegant activity trackers go, the Access Cosby by Michael Kors sits at the top of fashion. You’ll have several colors to choose from (navy diamond, black, rose gold, and silver), so it can go with any outfit you may have planned out. Its design is simple and modern, capable of blending in as a fashionable bracelet that sits comfortably on the wrist. You’d expect nothing less from a device designed by a fashion brand. The features on this tracker are relatively basic. You’ll have a heart rate monitor and step counter, and you can view your progress for the day on its compatible app. It also monitors your sleep quality and the distance you’ve traveled. The battery can run for up to four months before needing a recharge, which brings a new level of convenience to fitness tracking products. No display to view progress. Some customers found that it was difficult to put on. 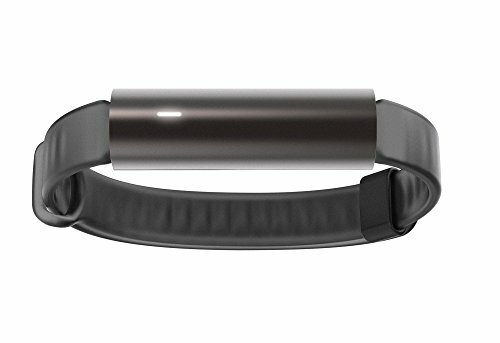 The Mira fitness bracelet is another well-designed fitness tracker that not only boasts a modern and elegant look, but is versatile and comfortable to wear. You get a stainless-steel band in either a brushed gold or dark purple color. The fitness tracker can snap effortlessly into the bracelet, or you can clip it onto your clothes like a brooch. One of the nice features is a display on the fitness tracker itself, instead of relying solely on the app. 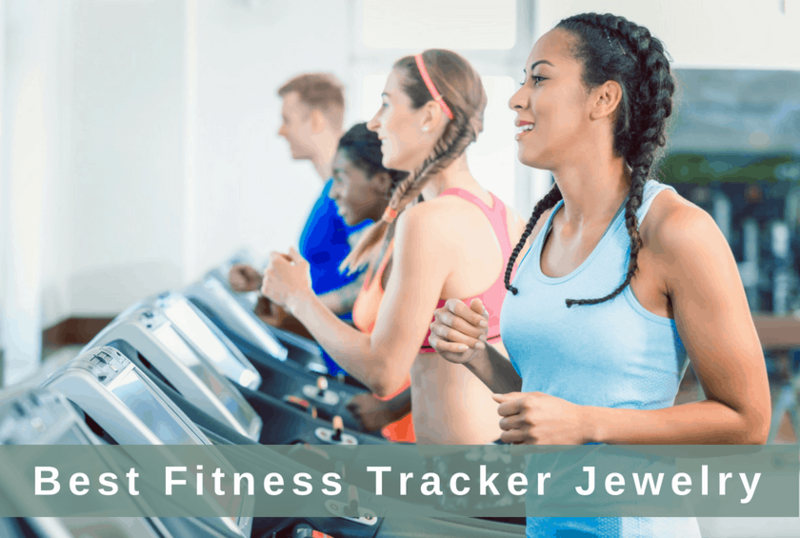 You can access information regarding steps you’ve taken, elevation, distance traveled, and calories burned all by gently squeezing the sides of the tracker. You’ll also get to view the time from your display, which only adds to its versatility. The app itself is very nice, usable with both Android and iOS; and you’ll get a detailed graph of your activity for the day. If you need to burn extra calories to hit your goal, you can touch the “Need Inspiration” button to be given a wide variety of workouts that can help you meet your goal for the day. Records steps, distance, calories, elevation. 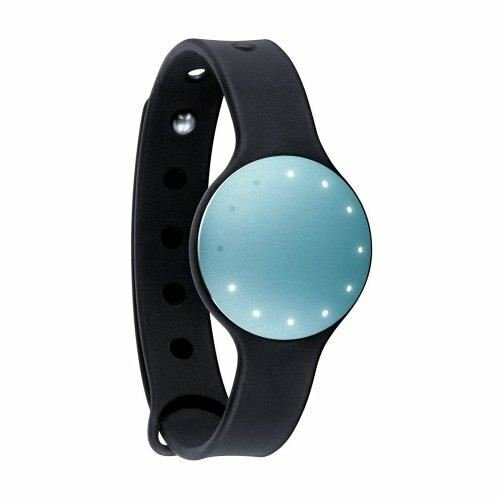 The Misfit Ray is a more basic activity tracker that can be worn as a bracelet or on a necklace. It holds a slim design and can pass as any piece of jewelry, no problem. The Ray will track your activity automatically when you start moving, and when you’re sitting still for too long, you’ll feel a vibration reminding you to get up and walk around. The app is supported on both Android and iOS phones, and is the sole way of monitoring your progress. That being said, it can give you ideas and exercises to help meet your calorie goals, and you’ll have a detailed chart that gives you a breakdown of all of your activities for the day. Even with all of these features, you’ll have the six-month battery life to keep you moving. It doesn’t fit all wrists. This smartwatch puts style and fashion before anything else. 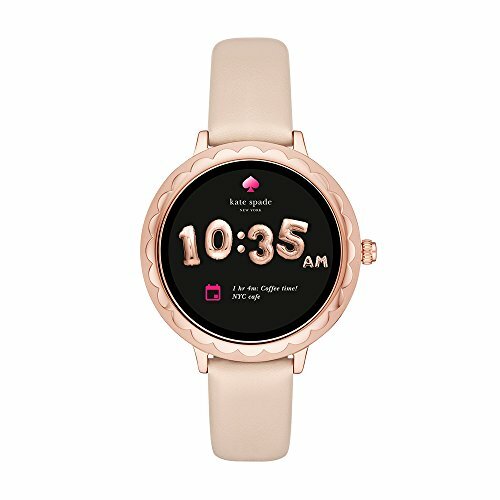 The Kate Spade smartwatch presents a beautiful design, coming in either gold or rose gold coloration with a leather strap to hold the display in place. You can determine what model you want as your watch face display to match the style elements you choose to dress in. The display itself present sharp colors and styles on a 390 x 390 resolution screen, although the watch could be considered a little large for a woman’s watch. Regardless, it has a touch screen display with swipe compatibility, able to track essential activities as you go about your day. The watch supports Bluetooth connection with either Android or iPhone. It shows you mobile notifications from third-party apps, plays music, and holds up to 4 GB of extra storage. You’ll also be able to give voice commands through the supported Google Assistant feature to pull up information either on your phone or your watch. This multi-sport fitness tracker looks like a watch without a display, circled by twelve LED lights. We’re not crazy about its looks, especially when compared to offering from Michael Kors and Kate Spade. But the features it presents make up in functionality what it lacks in looks. The one thing that sets this fitness tracker apart from the competition is that it’s fully waterproof. Not water resistant, but waterproof up to 50 meters. It’s small and lightweight, able to be worn on the wrist, your clothes, or even in the necklace-accessory Misfit Bloom (mentioned above). No matter where you wear it, this tracker is very accurate, and it only weighs nine grams by itself. You can track things such as your steps, sleeping quality and time, calories burned, and the distance you’ve traveled that day. You can look at your charted data by the day or even a week-by-week comparison to give you valuable insight into your activities. The Shine tracks walking, running, cycling and swimming with ease and you don’t have to prompt it to track your specific event. It’ll do it automatically. You may have to prompt it to record your sleep, but once you do, it gives reasonably accurate data on your sleeping patterns, although it would be better to clasp the tracker to your pajamas and not wear it on the wrist or as a necklace; otherwise, the results are less reliable. Updates are automatic and quick, so you’ll never have to wait for them. The app is only available on iPhones, but it’s designed to give your exercises the boost they need to keep you fit. You’ll have milestones provided for you that are updated regularly based on your activity levels, and everything is charted to help you keep up with your goals. Fully waterproof up to 50 meters. Long battery life lasts up to four months.